A few weeks ago when I was at my grandparents’ house, I could not get rid of my itch to bake. Even though I had just made a Salty Honey Pie the day before, I timidly asked my grandmother if I could bake some scones. I told her that Id’ checked and we miraculously had all of the ingredients, and that I would clean everything up after. And she said yes! Excited, I headed to the kitchen to throw together this easy recipe from The Pioneer Woman. They’re simple cream scones, elevated to a new height with the addition of vanilla bean and a delicious glaze. 2. Split the vanilla beans lengthwise down the middle and remove the “caviar” inside of it. Add the caviar, along with the scraped bean pods if you like, into the cream and stir. Set this aside for a good 15 minutes to let the flavors sink in. 3. While that’s sitting, grab a large bowl and sift together the flour, 2/3 cup of sugar, salt, and baking powder. 4. Cut the COLD butter into cubes and cut it into the flour mixture using A) two knives, B), a pastry cutter, or C) your fingertips. Work it in until your mixture resembles coarse crumbs. 5. Remove the vanilla bean pods from the cream (but keep the caviar in there, of course) and whisk in the egg. 6. Combine this with the dry mixture with a fork until the dough just starts to come together. 7. Transfer your dough to a floured surface and gently press it into a rectangle. Use a rolling pin to roll it until it’s about 1/2 to 3/4 of an inch thick. 8. Trim the sides with a knife and cut your dough into 12 rectangles of the same size. Cut each rectangle in half so that you wind up with 24 identical triangles. 9. Line a baking sheet with parchment and bake for 18 minutes, or until they are just starting to get golden brown. Cool on a cookie sheet for around 15 minutes before transferring them to a wire rack. 10. To make the glaze, scrape the caviar out of one vanilla bean and stir it into the milk. Set this aside for a while. 11. Stir together the powdered sugar and milk. You may need to add more milk if you deem it necessary. You’ll want to whisk/stir it until it’s smooth. 12. 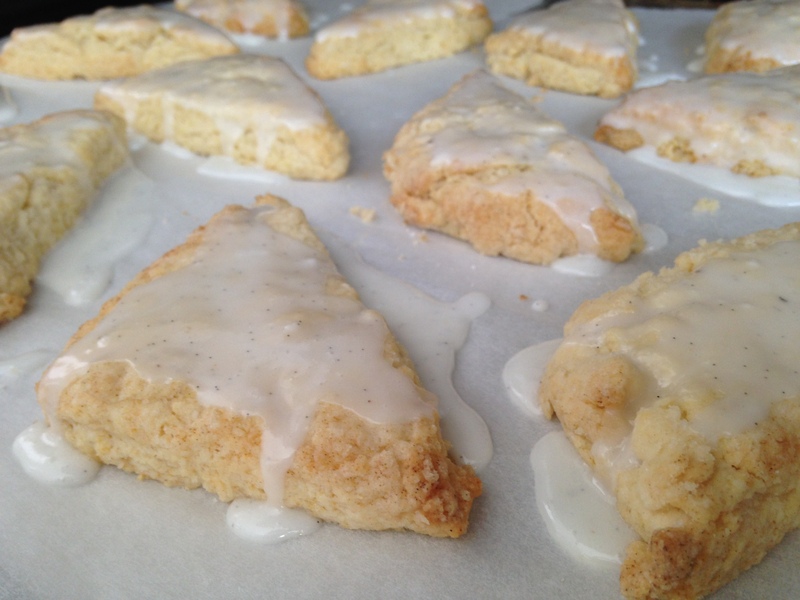 Once the scones are cooled, either dunk them in the glaze or drizzle the icing on top. Try to wait for it to set before digging in!